Konatsu Narumiya is 16-year old girl and the manager of a boys' basketball team, and she's also in love with one of the players, Yamaguchi. Although she considers the object of her affection to be a jerk, she's really smitten by him. Konatsu confides this to another player, Haruki Sugimoto, but chance reveals Haruki's own secret. At night, Haruki transforms from a teen boy into a beautiful, but lustful girl. Now, Konatsu has feelings for Haruki as a boy, but he may not have any for her. Meanwhile, his female persona, which he calls " Haruko," wants to be Konatsu's lover. Kedamono Damono has all the makings of a big budget, high concept Hollywood romantic comedy - girl loves boy, but boy turns into a girl at night. Yet the Manga by Haruka Fukushima is a romantic tumult of deep affection, awkward teen love, and heavy physical intimacy, and also more thoughtful than many romantic comedies. 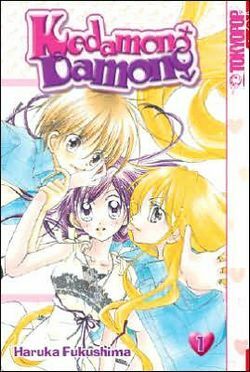 The rating that TOKYOPOP has given this title (Teens 16 years and older) doesn't mean that Kedamono Damono is like Kimberly Peirce's film, Boys Don't Cry, but it still is some serious shoujo-ai (girls' love). Sometimes, the main plotline concerning Konatsu and "Haruko" seems stretched, but there are some wonderful supporting characters with potential that can liven things up a bit. I'm curious to see where this goes. Thanks to barnesandnoble.com for the images. © Copyright 2002-2018 by Toon Doctor Inc. - All rights Reserved. All other texts, images, characters and trademarks are copyright their respective owners. Use of material in this document (including reproduction, modification, distribution, electronic transmission or republication) without prior written permission is strictly prohibited.